10.1 What Makes a Wave Grow Unstable? 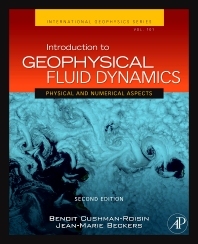 Introduction to Geophysical Fluid Dynamics provides an introductory-level exploration of geophysical fluid dynamics (GFD), the principles governing air and water flows on large terrestrial scales. Physical principles are illustrated with the aid of the simplest existing models, and the computer methods are shown in juxtaposition with the equations to which they apply. It explores contemporary topics of climate dynamics and equatorial dynamics, including the Greenhouse Effect, global warming, and the El Nino Southern Oscillation. Recipient of the 2010 Wernaers Prize, awarded each year by the National Fund for Scientific Research of Belgium (FNR-FNRS).